Earlier this year the Scottish Sports Concussion Guidance document was published. This guidance document was produced for grassroots sports participants who don’t have easy access to Sports and Exercise Medicine specialists. It was produced and endorsed by experts from the Royal Colledge of Physicians and Surgeons of Glasgow, the Scottish Football Association, the Scottish Rugby Union, the University of Glasgow, the Scottish Sports Association, the Scottish Government, the University of Edinburgh and the Scottish Institute of Sport. Physical activity is vital for health and wellbeing in both adults and children, therefore the last thing as physiotherapists we would want to do is to reduce participation in football sport or activity. However it is important to ensure that participation in sport does not have an adverse affect on the participants’ health and wellbeing. Therefore it is essential to make sure that risks to an individual’s health and wellbeing are managed appropriately. First of all what is concussion. A Concussion is a traumatic brain injury(TBI) which results in alteration of brain function. There are many potential symptoms associated with concussion and these are summarised below. A common misconception is that there needs to be a loss of consciousness to make a diagnosis of concussion. In fact this occurs in less than 10% of concussions. Concussion can be caused by direct trauma to the head, but it can also be caused indirectly. This is when a blow to a different part of the body results in rapid movement of the head, similar to whiplash. While people of all ages can sustain concussion, children and youths under the age of 18 years of age are particularly susceptible. This is one of the reasons why the staff at the clinic have a particular interest in concussion as between us we are involved in coaching football and rugby to under 18’s and we all have children who play or probably will play football or rugby. In addition professionally a lot of our patients who are under 18 who have sports injuries; play football, rugby or other activities like gymnastics where it is not unreasonable to expect that they may sustain a blow to the head. In addition they take longer to recover, have more significant memory and other cognitive issues and are more susceptible to rare and dangerous neurological complications. These can include death caused by single or second impact. Previous episodes of concussion increase the risk of further concussions and the length of time it may take to recover. Therefore each episode of concussion needs to individually assessed and treated. The symptoms of concussion can start at any time however they will generally appear in the first day or two following a head injury. There are a number of different symptoms that can be present, therefore the individual will not present with all of them. So if any of the symptoms below are present then you should suspect that concussion is present and the player should immediately be removed from play or training. Dazed, blank or vacant look. Lying motionless on the ground or slow to get up. Loss of consciousness or responsiveness. Confused or not aware of what is going on around them. More emotional or irritable for that person. Mental confusion or feeling slowed down. 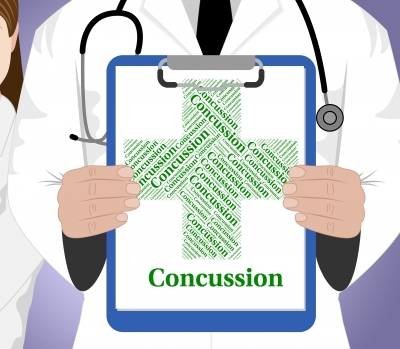 What should you do next if you suspect that an individual has been concussed? If you suspect an individual of being concussed they should IMMEDIATELY BE REMOVED FROM PLAY. They must not return to activity that day. If you suspect a neck injury then the player should only be moved by healthcare professionals with appropriate spinal care training. If any of the symptoms below are reported the individual should be transported to the nearest hospital for urgent medical assessment. In all cases of suspected concussion even if symptoms resolve the individual should be referred for medical assessment. The cornerstone of concussion treatment is rest. This involves both physical rest and cognitive rest. For adults a minimum of 7 days is recommended before restarting exercise. For those under 18 it’s recommended that the rest period should be 2 weeks. After the minimum rest period has passed and if they are symptom free at rest. The individual can start a graduated return to play or GRTP. This is a progressive exercise programme which introduces the individual back to sport in a controlled manner. Full details of the graduated return to play can be found in this document from Sport Scotland. Sport and other forms of exercise are essential for health and wellbeing, however it is vital that participation is safe and any risks to participants are recognised and reduced to the lowest level possible. Under 18s are particularly vulnerable to concussion and recover slower than over 18’s. Therefore it is vital that the guidance discussed here, is followed to reduce the risk of harm to the lowest level possible. The key messages are that having concussion does not mean there has to have been a loss of consciousness. All concussions are serious. Return to training and playing needs to be done according to the guidance on minimum period of rest and then the graduated return to play protocol. If there are any concerns delay return to play or training. The guidance document that I have referred to while writing this blog post and other resources including various pocket cards. Can be found on the Sport Scotland website which is here. This entry was posted in News and tagged First aid training, Rugby, Sports Injuries. Bookmark the permalink.